According to 2012 data on physician practice arrangements recently released by the American Medical Association (AMA), 57.3% of radiologists are part of single-specialty practices, while 19.1% are in multispecialty practices, 7.3% are in solo practices, 7.1% are hospital employees, and 9.2% are in some other arrangement. Looking at just those radiologists working in single-specialty practices, 85% are part of groups wholly owned by physicians, while 7.3% work in groups at least partly owned by hospitals. The remaining 7.8% work in other practice arrangements. And based on the AMA’s new data, radiologists are more likely to be working in wholly physician-owned practices than other doctors. The survey, which included 3,466 respondents, reported that 21.9% of all surveyed physicians in single-specialty practice work in practices that are at least partly owned by hospitals. It makes intuitive sense that most radiologists are part of physician-owned single-specialty groups, but it is those other situations that I’m more curious about. I want to know whether more radiologists are working in multispecialty groups. In the AMA survey, 19.1% of radiologists reported practicing in multispecialty groups, a percentage not dramatically different from the overall average of 22.1%. Large multispecialty groups are players in the accountable care organization movement. Any information or trends about radiology participation in this area should be of interest to radiologists, hospitals, and care systems. Previous AMA surveys didn’t measure practice arrangements to answer this question. The percentage of radiologists reporting that they were hospital employees was 7.1% in the AMA survey, not much different from the 5.6% rate in all specialties. But other surveys report very different data. For example, a 2013 survey by the recruiting firm Jackson Healthcare found that 26% of surveyed physicians reported being hospital employees, a much larger percentage than the AMA survey. The 2012 edition of the American Hospital Association’s Hospital Statistics Report found that 17.2% of physicians are directly employed by hospitals. While the numbers are different, the directionality seems the same; most statistics suggest that hospital employment of physicians is moving upward. It also seems that radiologists lag behind others specialties in that regard. Whether it’s hospital employment, some kind of hospital partnership, practicing in multispecialty groups, involvement in any of the other teleradiology-driven hybrid radiology practices, or just consolidation into larger groups, radiology practice arrangements seem to be changing. I look forward to obtaining some feedback on the topic at RSNA. 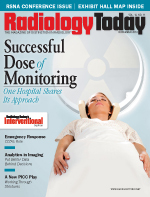 To help you get ready for the meeting, take a look at our RSNA Road Map starting on page R1. I hope to see some of you in Chicago at booth 3112.